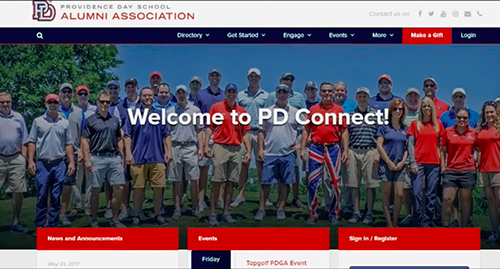 The Providence Day School Alumni Association has launched a new online platform to provide opportunities for the school’s 3,500 alumni to network and engage with one another, and the school. PD Connect went live July 12. The launch was announced across PDS-related social media channels and via a letter to alumni from Colby Anderson ’07, Board of Alumni president. Features include an alumni directory and an alumni “career center,” as well as the ability to register for alumni-related events. The site also offers alumni the ability to find mentors in various fields and to volunteer to serve as mentors to other alumni. Alumni can register at alumni.providenceday.org.